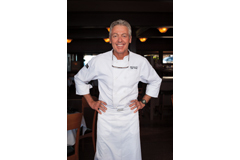 DESCRIPTION: Known for his “Cuisine Unique”, a blend of western and eastern flavors, Chef-Owner Douglas Dale will share his ingredient and technique secrets that have made Wolfdale’s a Lake Tahoe favorite since 1978. Learn how his motto “Fresh Food, Simply Prepared” will translate into improving your kitchen skills and bring new ingredient and flavor combinations to your cooking. Back to NTI! by overwhelming demand, you can learn from the master himself as he teaches you how to transform food into cuisine.